In America in 1621 there was a New England, a New France, and a New Spain. 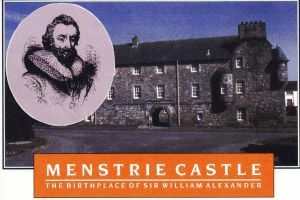 An enterprising Scot, Sir William Alexander of Menstrie who made made a Knight in 1609, attracted the attention of King James (VI of Scotland and I of England), who held court regularly at nearby Stirling, when he proposed that it might encourage development of a New Scotland if His Majesty were to offer a new order of baronets. The King liked the idea. After all, his creation of the Baronets of England in 1611 and the Baronets of Ireland in 1619 had raised £225,000 for the Crown. At Windsor Castle on September 10, 1621 King James signed a grant in favour of Sir William Alexander covering all of the lands ‘ between our Colonies of New England and Newfoundland, to be known as New Scotland ’ (Nova Scotia in Latin), an area larger than Great Britain and France combined. On October 18, 1624 the King announced his intention of creating a new order of baronets to Scottish ‘ knichts and gentlemen of cheife respect for the birth, place, or fortounes ’, James I died on March 27, 1625 but his heir, Charles I, lost no time in implementing his father’s plan. By the end of 1625 the first 22 Baronets of Nova Scotia were created and, as inducements to settlement of his new colony of Nova Scotia, Sir William offered tracts of land totalling 11,520 acres ‘ to all such principal knichts & esquires as will be pleased to be undertakers of the said plantations & who will promise to set forth 6 men, artificers or laborers, sufficiently armed, apparelled & victualled for 2 yrs ‘. Baronets could receive their patents in Edinburgh rather than London, and an area of Edinburgh Castle was declared Nova Scotian territory for this purpose. In return they had to pay Sir William 1000 merks for his ‘ past charges in discoverie of the said country ‘. The harsh climate killed many of the early settlers but the fatal blow for those who remained came in 1632 when Charles I ceded the lands to Louis XIII of France and ordered the removal of the colony and destruction of Charles Fort at Port Royal. The Order of Baronets continued, however, and grants of land were made until the end of 1639, by which time 122 baronetcies had been created, 113 of whom were granted lands in Nova Scotia. The Order continued until 1707, by which time 329 baronetcies were made. Sir William Alexander, Earl of Stirling and Viscount of Canada, who was born at Menstrie Castle in 1567, and is often referred to as the "Founder of Nova Scotia", died bankrupt in London in 1644. His embalmed body is interred in the family vault in the High Kirk of Stirling. In October 1953, Premier Angus Macdonald unveiled a plaque at Edinburgh Castle to commemorate Sir William Alexander and the Baronets of Nova Scotia. When Menstrie Castle was scheduled for demolition in 1956, it was donations from Scots in Nova Scotia and other parts of the world that financed its restoration, and a wall of one of the Nova Scotia Commemoration Rooms is covered with shields portraying the arms of 109 Baronets of Nova Scotia, surrounding a portrait of King James [VI of Scotland and I of England]. 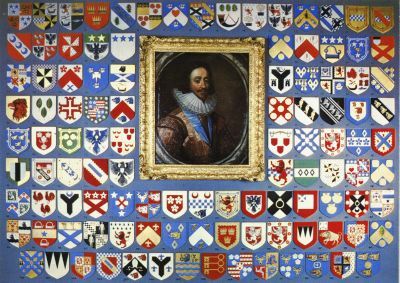 In 1994 Trevor Croft, then Regional Director, Central and Tayside Regional Office, National Trust for Scotland, provided a list of the baronetcies depicted here. There are still about 100 Baronets of Nova Scotia in existence, many of them descendants of those who once owned land there - land which they never set foot upon. In Halifax’s Victoria Park a cairn dedicated to Sir William Alexander stands at one end, with a statue of Robert Burns at the other end. Richard Oliphant of Condie advises that Nova Scotia baronets are senior to any other baronets in rank in Scotland and are entitled to wear a medal denoting that they are NS baronets. The following is a list of the Shields [#001-115] portraying the Arms of Baronets of Nova Scotia on display in the Commemoration Room at Menstrie Castle - courtesy of the National Trust for Scotland Regional Office responsible for Menstrie Castle. Those who did not hold baronies in the new province are marked with an asterisk (*); (s) indicates that seisin was taken thereof; (d) indicates that the title is now dormant or extinct; and (f) forfeited. None of the 207 Baronets created after 1639 received land grants in Nova Scotia. Of the 122 listed below, 113 held baronies in the new province. The nine who did not are marked with an asterisk (*); (s) indicates that seisin was taken thereof; (d) indicates that the title is now dormant or extinct; and (f) forfeited. Also included are the Shields [# 001-115] portraying the Arms of Baronets of Nova Scotia on display in the Commemoration Room at Menstrie Castle. Each baronetcy is listed alphabetically for easy reference. None of the 207 Baronets created after 1639 received land grants in Nova Scotia. The above information is based on available sources. I would welcome any additions or corrections to the above lists from anyone with more knowledge of this subject, which is still not well understood by many people in Canada.